So ok how many of you like me have struggle trying to fix your head phone cords after you put them away and for some odd reason when you go to look for them they are all tangled up? Yea I know I’m not the only one! Or when you are in the gym and you have them on and some reason they get stuck together ohhhh the struggle..
That’s why I am glad to have the Anti-Tangling, Protective and Fashionable sleeves for my earbuds. First I love the color ice blue it is a nice light glossy color. You can adjust and cut the sleeves to your perfer length on your earphones, including the ones that has a built in microphone for you to talk. I also remember every time I used the ones with the microphone when I had to drive and when I search for the earphones they were a big mess. 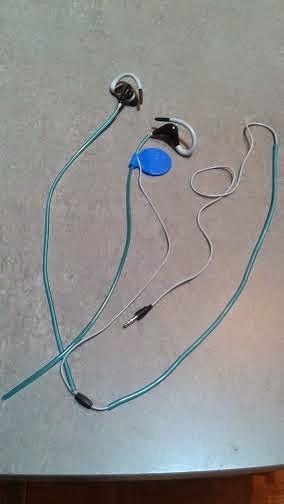 Love that It does not tangle when you use them in running, exercising nor when you put them away. You do not come back to see a big knot or even if your kids get a hold of them. Also they come in 11 different colors so you can get one for every mood. They are very flexible so you won’t have any problems with them. They come with a skinner tool so it would be easier for you to slide the sleeve to your earphones. *I received this product in exchange for my honest and unbiased review, I only recommend products or services I use personally and believe will be good for my readers. All opinions are 100% my own.